Little Bighorn: A Novel by John Hough Jr. I wanted to mix things up and read something out of the box for me. It didn’t hurt that BookBub has this listed for next to nothing, so I figured why not. As a favor to the beautiful actress Mary Deschenes, Lt. Colonel George Armstrong Custer hires her eighteen-year-old son Allen Winslow as an aide for his 1876 campaign against the Sioux and Cheyenne. Traveling west against his will, Allen finds himself in the company of Addie Grace Lord, sixteen, sister of one of Custer’s regimental surgeons. Well… so… see… okay the last two parts of the book are amazing and wonderful and just plain awesome. But where was this awesome writing during the first two parts of the novel? Allen Winslow is given a job as aid to Colonel Armstrong Custer. A bedside favor to his mother from Custer. Right there is a great story. Sadly this doesn’t go anywhere or isn’t explored. Allen and Addie Grace fall in love during their trip to Fort Lincoln but dear lord there is no spark, no chemistry between them. Allen proclaims his love for her randomly to some random person in front of her and it’s like where the heck did that come from? Like he doesn’t even tell her, he tells someone else, in front of her. And for the love of chocolate, I want to send Hough a thesaurus so bad. I think Hough used the word “said” more than any other author that I have ever read. There are these long conversations between multilple parties and each character’s sentence ends with so and so said. Blah, blah, blah said person X. Blah, blah, blah said person Y. Blah, blah, blah said person Z. Really? No one articulated, recounted, voiced, expressed, exclaimed, stated or told? If you need to be so specific to articulated who said what then maybe you should to rewrite the sentence. That a being said, the last two parts were very well done. The battle was grotesquely magnificent. The Prologue was full of emotion that it caused me wonder if the same person wrote the entire novel. I think Hough had a great idea for a short story but could not harvest it into a novel. 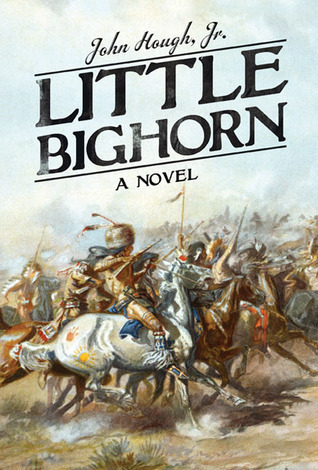 This entry was posted in Adult Fiction and tagged Adult Fiction, Historical Fiction, Little Bighorn: A Novel; John Hough Jr.. Bookmark the permalink.